If you want to impress your friends, simply learn this easy-to-do recipe for your next dinner party. I love to pair these lobster tails with creamed spinach, hot bread rolls, melted butter, and lots of vino! Recipe by Chef Matt Dean Pettit and taken from "The Great Lobster Cookbook" ©2014 Penguin Random House Canada. 1. Thaw the lobster tails. Rinse and pat dry with paper towel. 2. To butterfly the tails, use kitchen shears or a sharp knife to cut lengthwise through the centre of the hard top shells and meat, cutting down to but not through the bottom of the shells. Prise the shell halves apart with your fingers and pull the meat upward, setting it on the back of the cut shells. 3. In a small saucepan, melt the butter over medium heat and add the garlic. Remove the pan from the heat. Stir in the chives and lemon juice. Remove 2 Tbsp of this sauce and reserve it in a small bowl. Place the remaining sauce in a separate small bowl. 4. Preheat the grill to medium heat (around 350ºF). 5. Brush the lobster meat with the 2 Tbsp of the reserved butter sauce. 6. Place the lobster tails on the grill, meat side down. Close the lid and grill for 4 to 5 minutes. 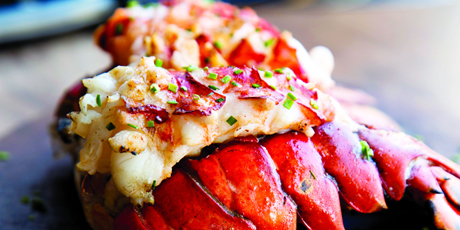 Remove the lobster tails from the grill and brush with the remaining butter sauce before serving.